Donald Trump’s pledge to halt all new HIV infections in the United States within a decade was dismissed as an “empty gesture” by activists who said his administration had stripped resources from those fighting the epidemic. Critics said the promise made in the State of the Union address was at odds with his actions, including cutting funding for research, and firing the entire White House presidential advisory council on HIV and AIDS. “This pledge is nothing more than an empty gesture following a series of actions that have ignored the needs of the communities most affected by HIV”, said Scott Schoettes, HIV project director at civil rights group Lambda Legal. “We need action, not just words, to solve the HIV/AIDS epidemic in the United States”, he said in a statement. Nearly 40,000 people in the United States were diagnosed with HIV in 2017, according to data from the US Centers for Disease Control and Prevention, with numbers remaining roughly stable since 2012. Gay and bisexual men accounted for two thirds of all those newly infected, with black gay and bisexual men at highest risk. 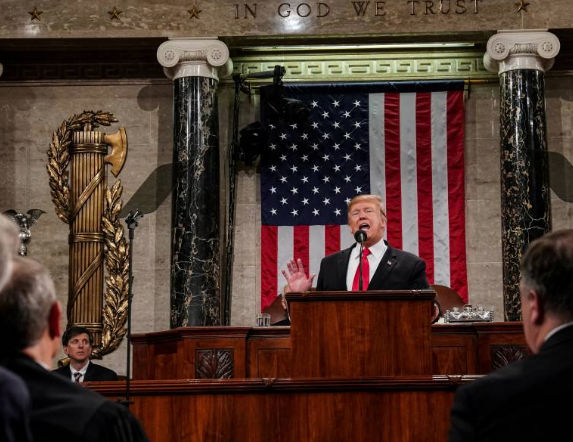 Trump hailed the “remarkable progress in the fight against HIV and AIDS” in his State of the Union speech, and said his new budget would lay out commitments to halt the disease within a decade. “Together, we will defeat AIDS in America”, said Trump, giving no details of how this would be achieved. Activists said his administration had left HIV risk groups more exposed. They pointed to actions including cutting funding for health research, working to roll back healthcare for vulnerable groups, and offering support for medical staff, who refuse to treat LGBT+ patients on religious grounds. “President Trump once again presented a broad strokes narrative that people with HIV and AIDS, including LGBTQ Americans, simply can’t trust”, tweeted Sarah Kate Ellis, chief executive of US LGBT+ advocacy organisation GLAAD. “The only way our world could end HIV transmissions and prioritize proper treatment and prevention is through an exhaustive, across-the-board investment, but President Trump’s words do not back up his administration’s actions”. Britain also said last week it aimed to end new HIV transmissions by 2030, through better healthcare measures to prevent, detect and treat the condition. The United Nations warned last year that rates of new HIV infections threatened to derail global efforts to defeat the disease, blaming a funding crisis.